ST. GEORGE — Zion National Park is scheduled to begin operating mandatory shuttle service through the Zion Canyon Scenic Drive once again starting Saturday. The shuttles will operate through November and take visitors from the Visitor Center through the canyon, making nine stops along the way. The shuttle service also makes nine stops through the town of Springdale. The scenic drive through the canyon will be closed to private vehicles while the shuttles are running except for those staying at the Zion Lodge. Visitors are also reminded that as of Friday, the Zion-Mount Carmel Highway is currently closed between Canyon Junction and the Zion-Mount Carmel Tunnel due to a rockfall, restricting through traffic to the east side of the park. Visitors can still access that part of the park by entering through the east entrance, but some canyoneering routes remain closed. The Kayenta Trail, Upper Emerald Pools Trail, Middle Emerald Pools Trail, the terminus of Lower Emerald Pools Trail and Hidden Canyon Trail also remain closed at this time, while Kolob Canyons, located off Interstate 15 Exit 40, has reopened after a nine-month closure. Starting Saturday, shuttles in the main Zion canyon will depart from the Visitor Center beginning at 7 a.m. 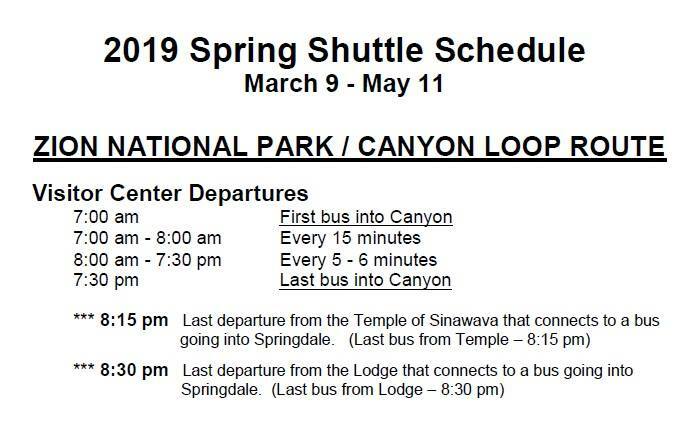 The last bus will leave the Visitor Center at 7:30 p.m., and the last bus returning from the end of the route at the Temple of Sinawava will leave at 8:15 p.m. to head back to the Visitor Center. Shuttles will leave the Visitor Center every five minutes from 8 a.m. to 7:30 p.m., according to a press release. Springdale shuttles will run every 15 minutes during peak hours and operate from 8:10 a.m. to 9 p.m. Visitors are encouraged to prepare for winter weather conditions during this time of year. Snow or icy conditions could delay shuttle operations at any time. Visitors should be prepared for winter driving conditions during their travels. Trials in the park can be icy, and most wilderness routes are covered in deep snow.